As the world’s population continues to climb toward 8 million people, agriculture is becoming increasingly important. It is estimated that over half of the planet’s habitable land is currently being used to feed such a massive, and still growing, population. Large-scale agriculture is now taking a toll on the environment, contributing to rising greenhouse gas emissions, deforestation and pollution in waterways. The cost of producing food is high, yet 30-40 percent of the American food supply is wasted every year, according to the USDA. Food waste is a problem that is present anywhere food is eaten, including households, supermarkets, restaurants and on college campuses, where over 20 million pounds of food goes unused every year. The University of Alabama is taking steps to combat food waste. Last year, the amount of food waste on campus was reduced by 20,610 pounds. The effort to cut down on food waste is spearheaded by Aramark Corporation, the food service company that manages the UA dining halls and commercial restaurants. Bruce McVeagh, the district manager for Aramark, is at the forefront of the battle. The first front that Aramark focuses on is tracking how much food people eat, when they eat it and how much food dining halls should prepare as a result. By using that data, dining halls can more accurately know how much food they need to make on a day-to-day basis, which eliminates overproduction. But that alone doesn’t cut down food waste. Aramark also works to ensure that employees are not being wasteful in how they prepare food, down to the very pepper. In order to ensure that employees are maximizing the ingredients they utilize to make dishes, Aramark partnered with Leanpath, a food waste prevention technology company. Since partnering with Leanpath in 2017, Aramark has implemented food waste tracking terminals in the kitchens of every dining hall. The terminals feature a camera and a scale, along with a touch-screen interface. When an employee prepares a piece of food, they place it on the scale and snap a picture of it. The weight is recorded and the picture is sent to the cloud, where it is later reviewed. UA dining halls wasted 26,327 pounds of food in 2018, which was down 49 percent from the year prior. 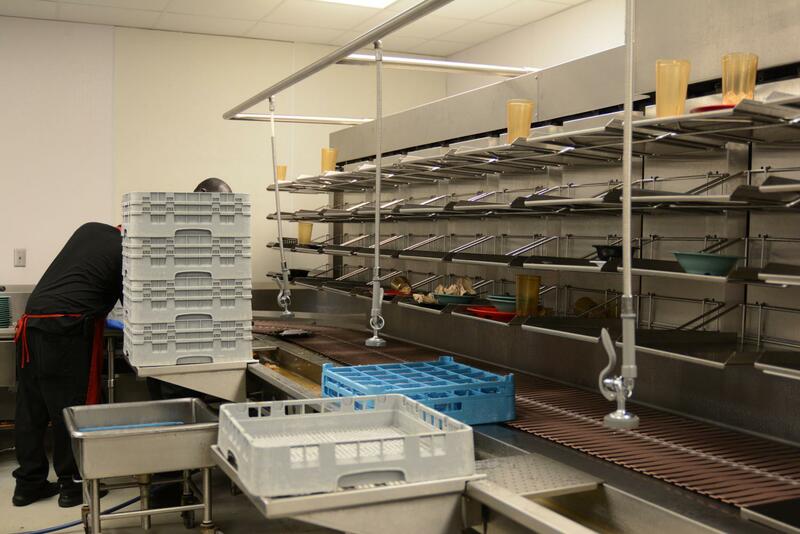 Even with Leanpath and more efficient cooking practices, dining halls still have excess food. It’s an almost unavoidable consequence of preparing large portions of food in an all-you-can-eat style. There is plenty of viable food that simply goes uneaten. To help alleviate perfectly good food going to waste, UA students are joining in on the fight. Emily Adams, a junior majoring in history, recently founded the UA chapter of Food Recovery Network (FRN) after taking an Honors College course in which she researched food instability on college campuses. Adams decided she wanted to help repurpose excess food at UA dining halls, so she partnered with Bama Dining to address the issue. Once FRN is fully established, which Adams said will be in the next month or so, it will send student volunteers to dining halls each week to pick up extra food and transport it to the West Alabama Food Bank. FRN isn’t the first student-based organization that has attempted to cut down on food waste, said Kristina Patridge, director of University Dining Services. But Patridge remains optimistic about the impact FRN can have. “They actually presented a proposal that seems really achievable,” Patridge said. Whether its Aramark instituting new technology in the kitchen, or a group of students aiming to feed hungry families, food waste on the UA campus is losing the war.